The new death happened in Iboko, a rural area in northwestern Equateur province, said the health ministry statement released Sunday. There are also four new suspected cases in the province, said the statement. Another person has died in Congo of a confirmed case of Ebola, bringing the number of fatalities to 12, said the country’s health ministry. The new death happened in Iboko, a rural area in northwestern Equateur province, said the health ministry statement released Sunday. There are also four new suspected cases in the province, said the statement. Congo now has 35 confirmed Ebola cases. 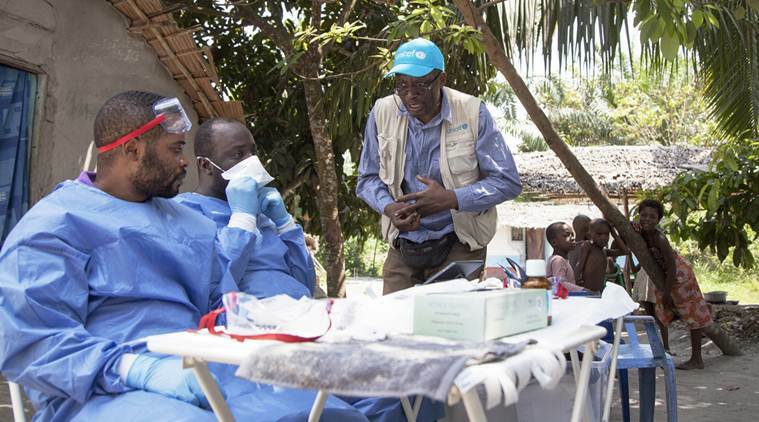 Health workers have identified people who have been in contact with confirmed Ebola cases in three areas in Equateur province, the rural areas of Bikoro and Iboko and Mdbandaka, the provincial capital of 1.2 million that is a transport hub on the Congo River. Congo’s health minister Saturday flew by helicopter to Bikoro and Iboko to see the deployment of health workers who will be tracing those who have been in contact with Ebola cases and inoculating them with a new experimental vaccine. Health minister Oly Ilunga was accompanied by representatives of the World Health Organization and UNICEF. The vaccination campaign in those rural is to begin Monday. The vaccination campaign is already underway in Mbandaka, where four Ebola cases have been confirmed. About 100 health workers have been vaccinated there as front-line workers face high risk from the virus, which is spread via contact with the bodily fluids of those infected, including the dead. The next few weeks are crucial in determining whether the outbreak can be brought under control, according to the World Health Organization. Complicating factors include its spread to a major city, the fact that health workers have been infected and the existence of three or four “separate epicenters” that make finding and monitoring contacts of infected people more difficult. WHO is using a “ring vaccination” approach, targeting the contacts of people infected or suspected of infection and then the contacts of those people. More than 600 contacts have been identified. WHO also is accelerating efforts with nine neighbouring countries to try to prevent the Ebola outbreak from spreading there, saying the regional risk is high. It has warned against international travel and trade restrictions. This is Congo’s ninth Ebola outbreak since 1976, when the hemorrhagic fever was first identified. There is no specific treatment for Ebola. Symptoms include fever, vomiting, diarrhoea, muscle pain and at times internal and external bleeding. The virus can be fatal in up to 90 percent of cases, depending on the strain.